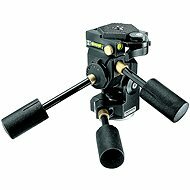 This lever-tripod head will ensure a smooth change of direction when shooting. The quick release mechanism will not delay you unnecessarily, so you can swiftly capture those long shots. It has been designed to carry and therefore, the massive head has been made from magnesium, which is light and yet strong enough to withstand use in the great outdoors. For shipping to other EU countries visit this page Velbon PH-358. Für Versand nach Deutschland, besuchen Sie bitte Velbon PH-358. Chcete doručit zboží do Česka? Prohlédněte si Velbon PH-358. Chcete doručiť tovar na Slovensko? Prezrite si Velbon PH-358. Für Versand nach Österreich, besuchen Sie bitte Velbon PH-358. Magyarországra történő kiszállításért tekintse meg ezt a termékoldalt: Velbon PH-358.